The Hofstra Law team of Alexis Fallon 1L, Reid Harris 2L, Dylan Nesturrick 1L and Mishal Pahrand 2L was a finalist in the eighth annual Capitol City Challenge, held from Feb. 25-28, 2016, at the new Tenley Campus of American University Washington College of Law. Harris also won the Eugene N. Hamilton Best Advocate award as the best advocate in the final round. The team was coached by Laura Kitchen ’12, Andrea Mauro and Jared Rosenblatt ’03. The competition featured a civil case problem and access to modern courthouse technology. 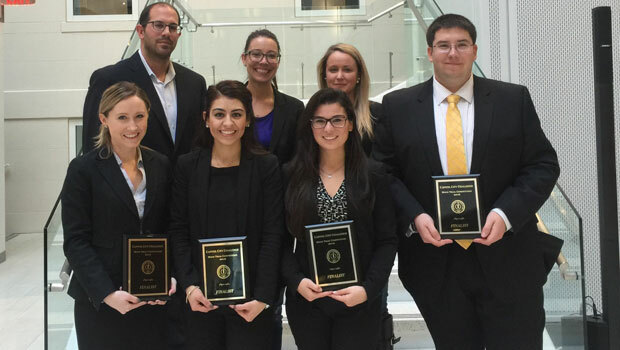 A Hofstra Law team also reached the finals of the 2015 competition.